Escherichia coli is the most widely used prokaryotic organisms for the industrial production of therapeutic proteins  . E. coli expression system has several advantages including well-characterized genetic, availability of different tools for manipulation, growth on inexpensive culture media, rapid and high-density biomass production and simple handling and processing development / scale-up  . Lack of eukaryotic post translational modifications and inclusion body formation are the main disadvantages. The improper conformation could make the expressed proteins undergo proteolytic degradation or aggregation  . Intra- or inter-molecular disulfides bonds cannot be easily formed in the reducing cytoplasm of E. coli which facilitates aggregation of certain disulfide bond-rich proteins  . There are some strategies to address these limitations. Engineering of folding pathway such as coexpression of the protein of interest with folding helper molecules (chaperones) is one of the most extensively used approaches to improve the yields of soluble proteins  . Folding modulators and chaperones could be divided into two subclasses depending on the area they are located and active in  . Cytoplasmic chaperones have three subgroups based on their mechanism of action: (a) folding chaperones which enhance the net refolding/unfolding of their substrates using ATP; (b) disaggregating chaperones which facilitate solubilization of aggregated proteins; (c) periplasmic chaperones are including generic chaperones such as Skp, PPIase and proteins involved in disulfide bond formation , . Another approach to improve the soluble proteins expression is exporting pathway engineering. Targeting the expressed proteins Another approach to improve the soluble proteins expression is exporting pathway engineering. Targeting the expressed proteins to the oxidative periplasmic environment or culture media could enhance the correct disulfide bond formation, produce more soluble proteins and decrease the purification cost in industrial scales  . Recombinant proteins can be targeted to the periplasmic or culture media space by fusing the protein of interest with appropriate signal sequences to their N-terminus. The most common translocation systems in E. coli are Sec system, signal recognition particle-dependent (SRP-dependent) pathway, and twin-arginine translocation (TAT) system. The Sec system like SRP pathway transports unfolded proteins across the cytoplasmic membrane while TAT system involves in transferring fully/semi-folded proteins which its preferences is to transport correctly folded proteins , . Human growth hormone (hGH, somatropin) is one of the most important hormones in the human body, playing a role in a variety of biological functions. As endogenous hGH is a non-glycosylated protein, therefore recombinant forms of hGH have been extensively produced in prokaryotic expression systems. However, inclusion body formation, low-yield recovery in biological activity and high cost of purification have encouraged researchers to make considerable efforts for secretory expression of somatropin , . In the current study, the effects of co-expression of a periplasmic chaperone, DsbA on the proper folding of somatropin and using TAT system signal sequences for exporting somatropin out of cytoplasmic space are studied. The combination of these two approaches, is supposed to produce more soluble proteins which are transported in periplasm or culture media. All chemicals and reagents were obtained from Merck (Darmstadt, Germany) and were of analytical grade. Antibiotics, chloramphenicol and ampicillin were purchased from Sigma Chemical Co. (USA) and the culture media (Nutrient and Luria agar/broth) from OXOID (Hamsphire, UK). DNA polymerase (Taq and PFU polymerase) and endonucleases were purchased from Fermenras (Thermo Scientific, USA). The constructs were synthesized by Biomatik (Canada) using coding optimization platform. Qiagen gel extraction kit was used for all purification from agarose gels according to the manufacturer's instructions. Plasmid purifications were carried out using the Qiagen miniprep kit. E. coli strains purchased from Invitrogen (USA). Chaperone plasmid set was obtained from TaKaRa (Japan). The expression vector, pET-22(b) was procured from Novagen (Madison, USA). The primers were synthesized and purified by Tag Copenhagen A/S (Denmark). All the genetic materials and bacterial strains are listed in [Table 1]. All the techniques used for manipulation of genetic materials were performed as described by Sambrook and Russell  . The constructs including signal sequences, target gene, somatropin, and DsbA as a chaperone, were synthesized chemically and cloned to pET-22(b) using NdeI/NcoI and NdeI/XhoI restriction sites for cassette I and III, respectively. The sequence of somatropin was obtained from www.drugbank.ca and checked with the United State Pharmacopeia (USP) for confirmation. Following codon optimization, the sequence was ordered for synthesis in fusion with the selected signal sequences. Two signal sequences, TorA and SufI, were used to construct two different cassettes. 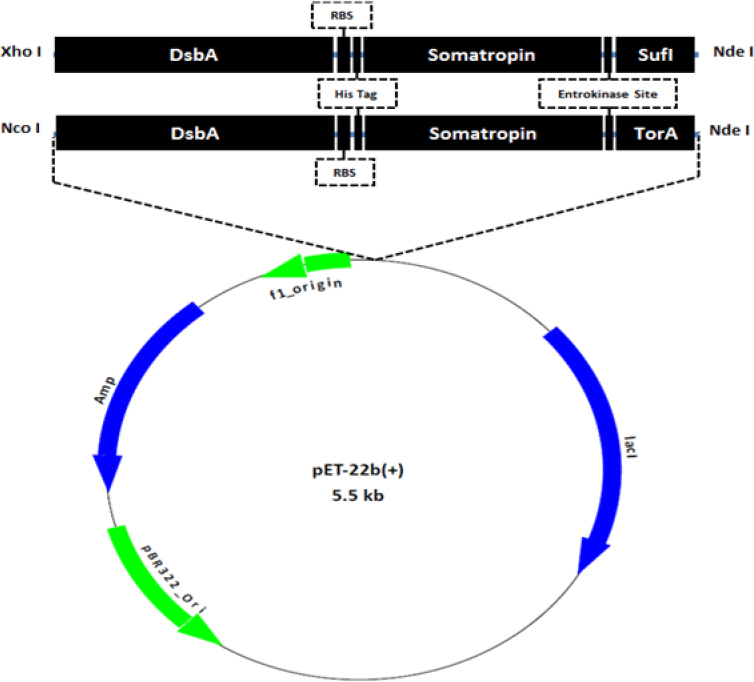 The first recombinant plasmid, pET-22b-TorA-hGH-DsbA (pMRB I) contained TorA as a signal sequence, somatropin and DsbA and the second pET-22b-SufI-hGH-DsbA (pMRB III) including signaling sequence SufI. His-tag was used at the C-terminus of somatropin to enhance the purification and western-blotting. The constructs were checked and confirmed by Polymerase change reaction (PCR) and digestion. Following plasmid preparation, an electroporation platform (GenePulser II, BioRad, USA) was used for transformation of the recombinant pET-22(b) to the expression host strain, E. coli BL21 (DE3). Two µL of recombinant pET-22(b) were added to a micro-tube containing 50 µL competent cells. The content of the tube was completely transferred to a new 0.2 mm electroporation cuvette. The electroporation system set at 25 µF, 2.5 kV, and 200 Ω. The pulse duration was around 5 ms. Following recover of the cells, two selective plates containing ampicillin 20 mg/mL were used; 20 μL of the culture was spotted on the first plate and the rest was used for the second plate, streaked out and incubated again at 37 °C for 24 h.
A single colony from the streaked plate was inoculated in 10 mL LB and incubated at 37 °C and 200 rpm overnight. Five mL of overnight culture (OD = 0.6) was used as inoculum for 50 mL media containing ampicillin as the selective marker. Following induction, the culture was incubated at 37 °C and 200 rpm for 4 h. As a control, the same procedure was applied for cassette including somatropin without any signaling sequence and chaperone. Following induction of the promoters and incubation at 37 °C, and 180 rpm for 4 h, the culture was harvested by centrifugation at 7000 g for 15 min to separate the clarified supernatant from biomass. The supernatant was used to study the translocation of somatropin to culture media. Cold osmotic shock method was carried out for the pellet of 50 mL culture to extract the periplasmic content of the cells. One mL of hypertonic solution containing sucrose 25% w/v, EDTA 5 mM and Tris-HCl 50 mM was added to the biomass. Following centrifugation, the supernatant was collected and kept at -20 °C for protein analysis. Then, one mL of hypotonic solution of MgCl 2 at 5 mM was added to the pellet of second centrifugation, resuspended and shaken for 60 min at 120 rpm and 4 °C. The cell suspension was centrifuged again for 15 min at 7000 g and 4 °C. The supernatant was kept at -20 °C. and 4 °C. The supernatant was kept at -20 °C. The pellet collected by centrifugation from the previous step, were resuspended in phosphate buffer (100 mM, pH 7.2). Following sonication, the suspension was centrifuged for 15 min at 7000 g and 4 °C and the supernatant was collected and kept at -20 °C as a cytoplasmic fraction for protein analysis. SDS-PAGE was carried out in 15% (w/v) acrylamide resolving gel with 5% stacking as described by Laemmli (1970). Proteins were stained by coomassie brilliant blue R-250. 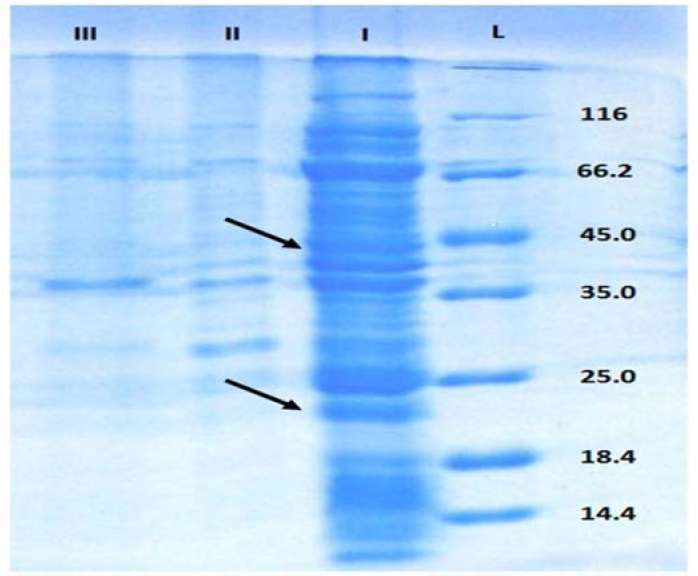 Western blotting was performed using DAB (diaminobenzidine) and anti-hGH monoclonal antibody for confirmation of the somatropin bands. The schemes of two synthetic cassettes are shown in [Figure 1]. Following sequence approval, the cassettes I and II were digested by NdeI/NcoI and NdeI/XhoI respectively. 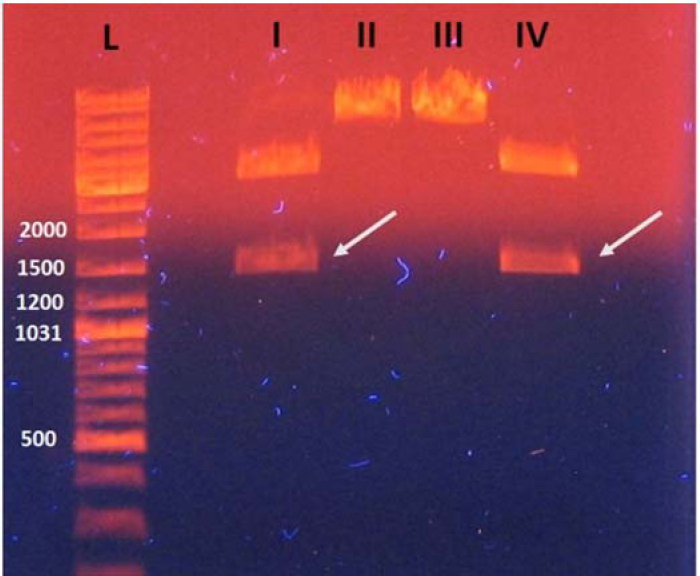 Following digestion, the fragments were run on agarose 1% (w/v) [Figure 2]. The inserts consisted of signaling sequence, growth hormone, and DsbA chaperone. Accordingly, the length of cassette I including TorA was 1465 bp [Figure 2], lane I) and cassette II with SufI was 1423 bp [Figure 2], lane IV). As mentioned before, two different cassettes containing different signal sequences were transformed to E. coli BL 21 (DE3) to study the effects of signaling sequence and coexpression with DsbA chaperone. The SDS-Pages are presented in [Figure 3], [Figure 4], and [Figure 5] which represent the control, cassette I and cassette III results, respectively. 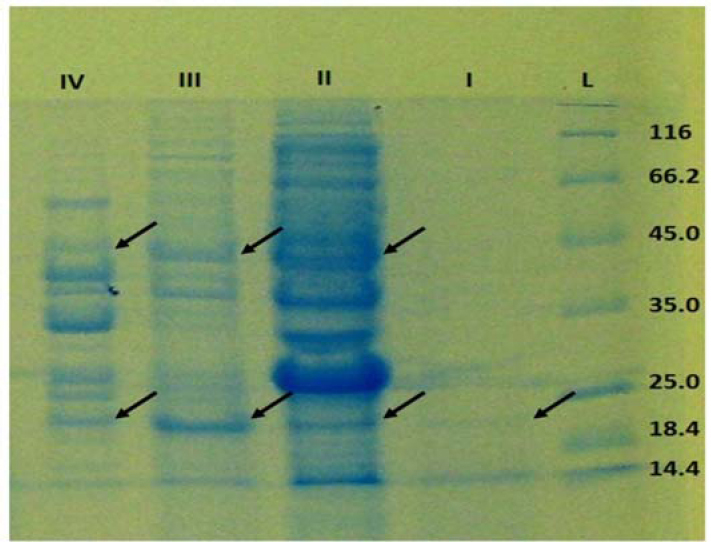 Western blotting for expression pattern of cassette I is shown in [Figure 6]. The approach of using signal sequences in combination with chaperone co-expression, could export the target gene, somatropin, from the cytoplasm to periplasmic space and culture media [Figure 4], [Figure 5], and [Figure 6] in comparison with control [Figure 3]. Figure 4. The expression pattern of the control group. The cassette containing somatropin without signaling sequence/DsbA. The periplasmic solutions were pooled and loaded on the gel as one fraction. The target protein, somatropin, with molecular weigh 22 kDa was not seen in periplasmic and culture media fractions (Lane II and III). All the expressed proteins were accumulated in the cytoplasm. Although expression system is capable of producing proteins in the absence of signaling sequence/DsbA (Lane I), the proteins form inclusion body in the cytoplasm. (L) protein molecular weight marker; (I) cytoplasmic fraction; (II) periplasmic fraction following the osmotic shock; (III) secretory fraction to culture media. The band around 45 kDa is the dimer form of target protein. Figure 6. 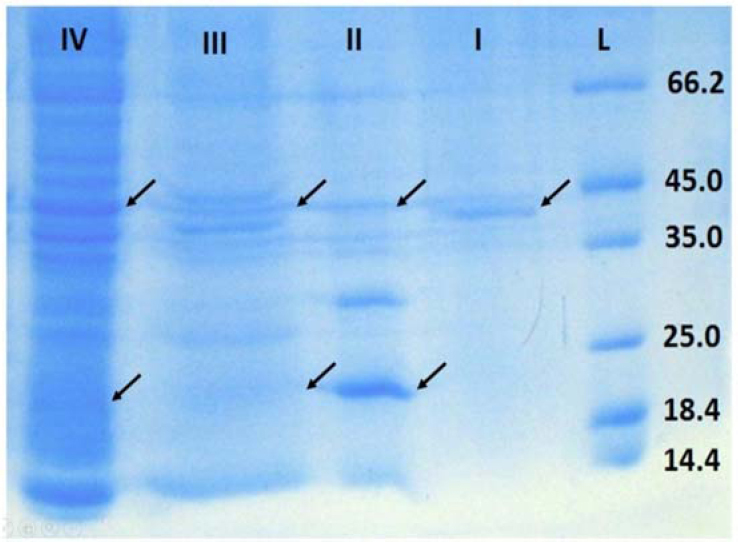 Western blot of the expression pattern of somatropin when using TorA/DsbA. (L) protein molecular weight marker; (I) cytoplasmic fraction; (II) secretory fraction to culture media; (III) periplasmic fraction following osmotic shock with a hypertonic solution; (IV) periplasmic fraction following osmotic shock with a hypotonic solution. The figure shows although the target protein is exported to periplasmic space and outside the cell, most of the protein is still located in cytoplasm. The hypertonic solution is eluted more protein compared to the hypotonic solution. The molecular weight of somatropin is 22 kDa. The band around 45 kDa is the dimer form. TorA as a signaling sequence could transport the targeted protein outside the cytoplasm; however most of the expressed proteins were located in cytoplasm yet. SDS-Pages of periplasmic fractions in cassette I confirmed that although somatropin is exported to both culture media and periplasmic space, most of the proteins were eluted by hypertonic solution [Figure 4] and [Figure 6]. It means that the system is more capable of exporting to periplasmic spaces than culture media. Presence of protein in culture media supports hypothesis that TAT signaling sequence could transport the protein to outside the cell. The quantitative study should be performed to evaluate the feasibility of this approach for secretory production of recombinant protein. SDS-PAGE of distribution pattern of somatropin expressed using cassette III showed the protein is highly accumulated in periplasmic space compared to control and cassette I. The sharp band which could be seen in lane II of [Figure 5] is the periplasmic fraction following osmotic shock. The hypertonic solution could elute the somatropin accumulated in periplasmic space. However, most of the proteins are accumulated in cytoplasm. In culture media, there is a no band which shows the export of somatropin to outside the cell [Figure 5]. Therefore it could be concluded although TorA could export the expressed protein outside the cell, SufI could not translocate the target protein. High-level expression of heterologous proteins in E. coli leads to inclusion bodies formation which imposes additional solubilization and refolding steps before purification , . Although, inclusion bodies could protect the expressed proteins from proteolysis, the overall cost of the production is increased. The recovery of biological activity following solubilization and refolding steps is not satisfactory as well. Therefore, numerous therapeutic proteins are exported to the periplasmic space or culture media using secretory pathways  . This approach offers several advantages including increasing in the production of a biological active form of the protein, proper disulfide bond formation, simplification of downstream processing and reduction in contamination with host cell proteins, nucleic acids and lipopolysaccharide. Sec-system has been studied very well for exporting heterologously expressed protein to periplasmic space and there are many reports in this regard  . TAT system is also another general protein transport pathway found recently in the cytoplasmic membrane of prokaryotes which conserved in plant chloroplast as well , . One of the most distinctive features of this system is that correctly-folded proteins could be exported to the periplasmic space. It is some kind of quality control system which identifies the correctly-folded proteins. For example, it has been reported that fusion of GFP to an MBP, a signal sequence of Sec-system, localized GFP in periplasmic space in an inactive form. However, fusing GFP to TorA, a TAT specific signal peptide, could export GFP to the periplasm which is fully active form. In the current study, export of the target proteins to periplasmic space and culture media was approved. However, to show that the transported proteins are active needs further study. Many studies have shown TAT pathway has considerable potential for the export of heterologous proteins in industrial applications. The export capacity of the TAT system for GFP is investigated by Matos et al.  . They showed that TAT system is highly active and enables to export GFP at the industrial expression level. They concluded that the export capacity of the TAT system is appropriate for industrial applications. This system has potential to export a range of native and heterologous proteins to the periplasm and there are some studies which confirm the export capacity is increased if the tatABC genes are overexpressed , . A variety of other heterologous therapeutic proteins such as somatropin, interferons, and single chain fragment antibodies have been exported by the TAT pathway which was active following secretion. It seems the only effective method for export of correctly-folded proteins to periplasm is currently fusion the target protein to a TAT-specific signal peptide ,, . In a study carried out by Matos et al., they used TorA signal sequence for expression different disulfide-containing proteins including two model proteins (PhoA and AppA) and two industrially relevant proteins (an anti-interleukin1b scFv and hGH) in an E. coli strain , . Three of these proteins were shown to be exported in an active state including somatropin. They concluded TAT pathway preferentially exports folded proteins  . Our data confirmed these results however the activity of hGH should be investigated in further studies. There are a couple of reports on the periplasmic expression of somatropin ,,, . Choi et al. reported lowering of the induction temperature significantly decreased the formation of somatropin inclusion bodies. They could solubilize most of the pelleted hGH under optimized culture conditions in periplasmic space [24,27] . The sequence of the signaling peptide is very important for efficient secretory expression of recombinant proteins and many studies are carried out in this regard. OmpA, STII, penicillinase, PhoA, LTB, NPR, DsbA, pelB, and natural hGH signal peptide were used in the different study to enhance the secretory expression of somatropin in E. coli ,, . In this regard, Zamani et al. has predicted the effect of different signal sequences on the efficiency of the system by in silico methods  . However their ranking is not approved by the in vitro studies. Effect of pelB signal sequence in the periplasmic expression of somatropin is studied by Kiany et al.  . They reported that T7-based system comparing to the lac-regulated system was more efficient in the expression of protein. As they used strong promoter systems, inclusion bodies were formed in the cytoplasm. Co-expression with chaperones could solve this issue as we confirmed in our study as well. These helping factors increase the ability of cells for proper folding of the proteins  . The effect of signal sequence was also studied by Sockolosky et al.  . They used pelB and OmpA signaling peptides at N-terminal of somatropin. The yield was higher for the cassette using pelB in comparison with OmpA. This study has also confirmed the effect of signal sequence on the production and secretory expression of the protein. The data resulted in current study confirmed that different signaling sequences could cause accumulation of the target proteins in different space as well. TorA could export hGH to culture media however SufI was more capable of transport of the protein in periplasmic space [Figure 4], [Figure 5], and [Figure 6]. In summary, the current study showed that using TorA and SufI as signaling sequence for TAT pathway and co-expression with DsbA, could transport the translated hGH to periplasmic space and culture media and reduce the inclusion body formation in the cytoplasm. The study demonstrated TorA signal could export the target protein to the culture media. However, there was a considerable amount of hGH in periplasmic space when using SufI compared to control. These data approved previous work regarding the potential of the TAT pathway for industrial applications in the production of recombinant therapeutic proteins. However, in next step it should be completely defined if the transported proteins are active or not. 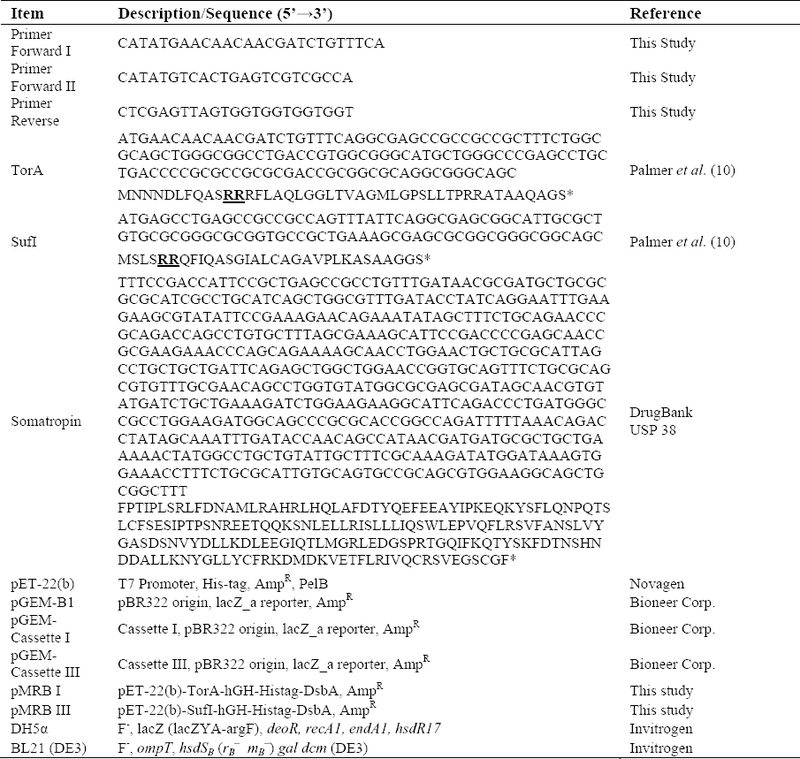 It is also highly suggested to use E. coli host strains which overexpressing tatABC genes. The content of this paper is extracted from the Ph.D thesis NO. 190083 submitted by Mohammad Reza Bagherinejad which was financially supported by the Research Department of Isfahan University of Medical Sciences, Isfahan, I.R. Iran. Rosano GL, Ceccarelli EA. Recombinant protein expression in Escherichia coli: advances and challenges. Front Microbiol. 2014;5:172. Assenberg R, Wan PT, Geisse S, Mayr LM. Advances in recombinant protein expression for use in pharmaceutical research. Curr Opin Struct Biol. 2013;23(3):393-402. Ami D, Natalello A, Lotti M, Doglia SM. Why and how protein aggregation has to be studied in vivo. Microb Cell Fact. 2013;12:17. Goltermann L, Good L, Bentin T. Chaperonins fight aminoglycoside-induced protein misfolding and promote short-term tolerance in Escherichia coli. J Biol Chem. 2013;288(15):10483-10489. Mergulhão FJ, Summers DK, Monteiro GA. Recombinant protein secretion in Escherichia coli. Biotechnol Adv. 2005;23(3):177-202. Albiniak AM, Matos CF, Branston SD, Freedman RB, Keshavarz-Moore E, Robinson C. High-level secretion of a recombinant protein to the culture medium with a Bacillus subtilis twin-arginine translocation system in Escherichia coli. FEBS J. 2013;280(16):3810-3821. Kim YE, Hipp MS, Bracher A, Hayer-Hartl M, Hartl FU. Molecular chaperone functions in protein folding and proteostasis. Annu Rev Biochem. 2013;82:323-355. Klatt S, Konthur Z. Secretory signal peptide modification for optimized antibody-fragment expression-secretion in Leishmania tarentolae. Microb Cell Fact. 2012;11(1):97. Palmer T, C. Berks B. The twine-arginine translocation (Tat) protein export pathway. Nature Rev Microbiol. 2012;10:483-496. Nguyen MT, Koo BK, Thi Vu TT, Song JA, Chong SH, Jeong B, et al. Prokaryotic soluble overexpression and purification of bioactive human growth hormone by fusion to thioredoxin, maltose binding protein, and protein disulfide isomerase. PLoS ONE. 2014;9(3):e89038. Sockolosky JT, Szoka FC. Periplasmic production via the pET expression system of soluble, bioactive human growth hormone. Protein Expres Purifi. 2013;87(2):129-135. Sambrook J, Russell DW. Molecular cloning: A laboratory manual, Vol. 3. 3 rd edition. Cold Spring Harbor, NewYork, Cold Spring Harbor Laboratory Press; 2001. Lin YH, Hsiao HC, Chou CP. Strain improvement to enhance the production of recombinant penicillin acylase in high-cell-density Escherichia coli cultures. Biotechnol Prog. 2002;18(6):1458-1461. Narayanan N, Khan M, Chou CP. Enhancing functional expression of heterologous lipase B in Escherichia coli by extracellular secretion. J Ind Microbiol Biotechnol. 2010;37(4):349-361. Daleke MH, Ummels R, Bawono P, Heringa J, Vandenbroucke-Grauls CM, Luirink J, et al. General secretion signal for the mycobacterial type VII secretion pathway. Proc Natl Acad Sci U S A. 2012;109(28):11342-11347. Chou CP, Tseng JH, Kuo BY, Lai KM, Lin MI, Lin HK. 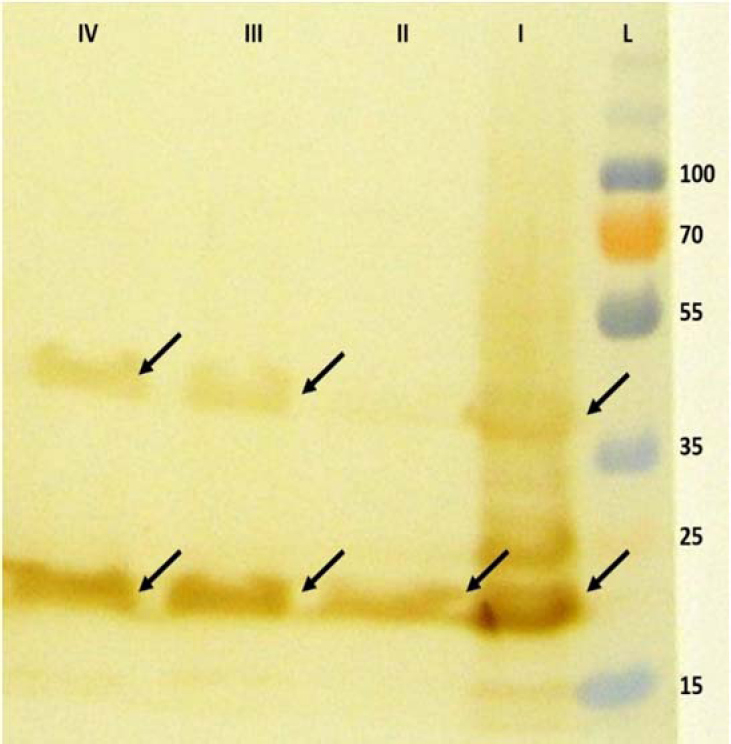 Effect of SecB chaperone on production of periplasmic penicillin acylase in Escherichia coli. Biotechnol Prog. 1999;15(3):439-445. Berks BC, Lea SM, Stansfeld PJ. Structural biology of Tat protein transport. Cur Opin Struct Biol. 2014;27:32-37. Palmer T, Berks BC. The twin-arginine translocation (Tat) protein export pathway. Nat Rev Microbiol. 2012;10(7):483-496. 20. Matos CF, Robinson C, Alanen HI, Prus P, Uchida Y, Ruddock LW, et al. Efficient export of prefolded, disulfide-bonded recombinant proteins to the periplasm by the Tat pathway in Escherichia coli CyDisCo strains. Biotechnol Prog. 2014;30(2): 281-290. Matos CF, Branston SD, Albiniak A, Dhanoya A, Freedman RB, Keshavarz-Moore E, et al. High-yield export of a native heterologous protein to the periplasm by the tat translocation pathway in Escherichia coli. Biotechnol Bioeng. 2012;109(10):2533-2542. Rodriguez F, Rouse SL, Tait CE, Harmer J, De Riso A, Timmel CR, et al. Structural model for the protein-translocating element of the twin-arginine transport system. Proc Natl Acad Sci U S A. 2013;110(12):E1092-E1101. Alanen HI, Walker KL, Lourdes Velez Suberbie M, Matos CF, Bönisch S, Freedman RB, et al. Efficient export of human growth hormone, interferon á2b and antibody fragments to the periplasm by the Escherichia coli Tat pathway in the absence of prior disulfide bond formation. Biochim Biophys Acta. 2015;1853(3):756-763. Kim MJ, Park HS, Seo KH, Yang HJ, Kim SK, Choi JH, et al. Complete solubilization and purification of recombinant human growth hormone produced in Escherichia coli. PLoS One. 2013;8(2):e56168. Levarski Z, Šoltýsová A, Krahulec J, Stuchlík S, Turòa J. High-level expression and purification of recombinant human growth hormone produced in soluble form in Escherichia coli. Protein Expr Purif. 2014;100:40-47. Choi JH, Lee SY. Secretory and extracellular production of recombinant proteins using Escherichia coli. Appl Microbiol Biotechnol. 2004;64(5):625-635. Low KO, Muhammad Mahadi N, Md Illias R. Optimisation of signal peptide for recombinant protein secretion in bacterial hosts. Appl Microbiol Biotechnol. 2013;97(9):3811-3826. Zamani M, Nezafat N, Negahdaripour M, Dabbagh F, Ghasemi Y. In Silico evaluation of different signal peptides for the secretory production of human growth hormone in E. coli. Int J Pept Res Ther. 2015;21(3):261-268. Kiany J, Zomorodipour A, Ahmadzadeh Raji M, Sanati MH. Construction of recombinant plasmids for periplasmic expression of human growth hormone in Escherichia coli under T7 and LAC promoters. J Sci, I.R. Iran. 2003; 14(4):311-316.